Jesse Alley is helping lead a team of Virginia Baptists in Haiti this week. This is the first in a series of updates from that team. We’ve completed our fist work day on the island and we are now waiting for dinner at the compound. 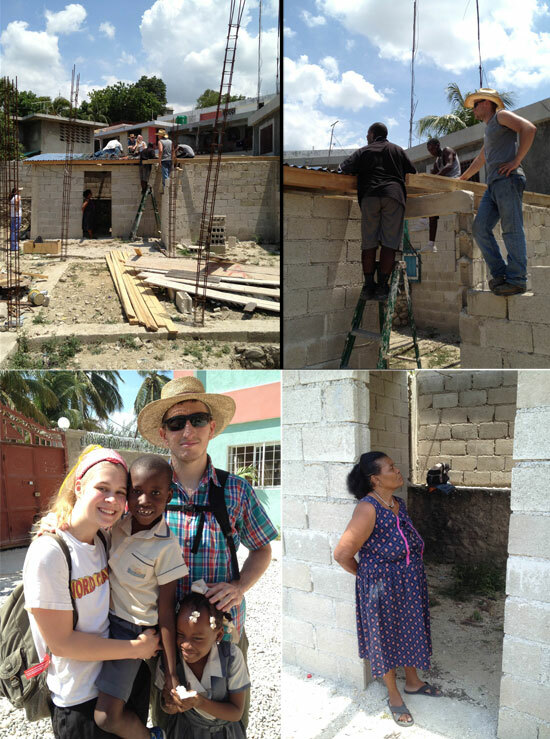 Today we helped three Haitians put up the roof over a newly constructed home. The home is indeed humble – 2 rooms each about 10’x10′. But it will provide shelter for a family (not sure how many people). In the picture “Homeowner” you can see the lady that will be living in the house. I’ve attached some pictures from our day today. One shows the worksite. All the construction is cinder block and concrete. In the “Worksite” picture you can see attenna-looking things coming up from the ground. This is rebar that is included in the foundation. That has already been poured. Each rebar tower will become a corner in the building. The roof is corrugated galvanized tin. They use 2×4’s for rafters spaced about 3′ apart and the tin laid directly onto the rafters. Not exactly load bearing, but it will keep the water out and provide shade. You can see a little bit of the roof in the “Josh Helping the Haitians” picture. We are working with 3 Haitians, 2 of which we know from previous trips (Jaffa and Elder). In the picture, you can see Jaffa on the ladder. Per the norm, it was brutally hot today – mid nineties and clear. And the sun is especially strong on the island. We’ve been taking care to drink water constantly and seek shade when we’re not do anything. We made it through alright though and now we’re ready to pound some awesome Haitian cuisine! Como ou’elle – what is your name? Mweh elle – my name is…. Como ou’ye – how are you? Mweh bien – I am good. Bondye Beni’ou – God bless you. Bon travi – good work. Trey bien – very good. Merci ampil – thanks a lot. I’m sure we’ll learn more vocabulary as we go along – we’ll be sure to pass along what we learn! Tomorrow we expect to work with the same people in the same area, but we will be working with concrete on the floor. This may mean laying the foundation for another room or beginning to lay bloc for another room. We’re not sure, but we’ll find out tomorrow. We are very excited about working in the orphanage later this week. We got a preview of what that may look like this morning during our meeting there. When we arrived for our brief meeting this morning, the children were very excited. We will begin painting some rooms for the kindergarten children and just getting the amazing opportunity to love on them and give them some attention that they so greatly deserve. During previous trips, Rebecca made friends with a little boy named Olivier who now attends school at the orphanage. She is holding Olivier in the “Jesse, Rebecca and Olivier” picture. That’s it for today. More will come tomorrow or the next day. If any of you would like to send a message to someone on the trip, feel free to reply to this email and I will pass it along.